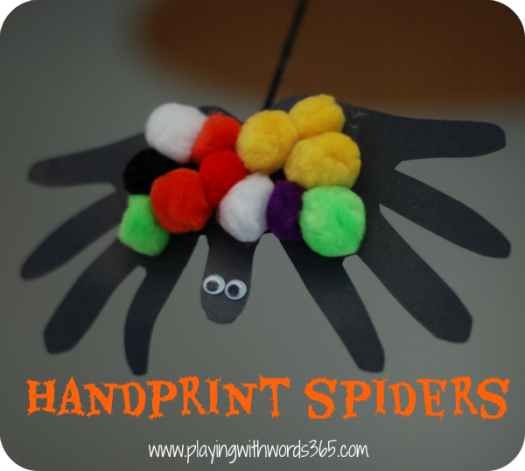 Today we made some hand-print spiders for Halloween! Even in such a SIMPLE craft like this, there are so many opportunities to learn and use language. First, next. last (as in the steps of the project). 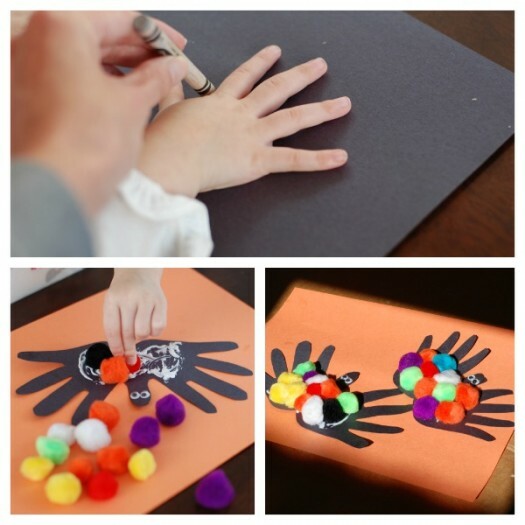 Place one of your child hands on one half of a piece of black paper, and with the white crayon, trace around his hand. Take the two hands and place them next to one another. Place glue on the left thumb. Place the right thumb on the left thumb, overlapping them. The two thumbs will be the spider’s head, and the fingers the spiders legs. Put glue all over the spiders back, and have your child cover his back with different colored pompoms. After the glue is dry, punch a hole in the spiders back and loop a piece of string through that can be used to hang the spider up. Talk about each step as you do it. Emphasize new words your child may not know (like overlap for example) and define them (i.e. overlap is another word that means to put one thing on top of another). As you trace your child’s fingers, count them one-by-one and encourage your child to join you in counting. Talk about the scissors. (Scissors are sharp. We use scissors to cut. My scissors are green. Etc). Talk about the glue and let your child feel and touch it (Glue is white and sticky. We use glue to make things stick together. Right now, the glue is wet, we need to let it dry, etc). Talk about the pompoms. You can talk about the different colors, their shape, their sizes…you can even have your child sort them by color or size. Count how many your child puts on the spider’s back. Talk about the eyes (if you have different sized eyes you can also sort by size). how many eyes does the spider have? how about you, how many eyes do you have? Once the spider is dry, talk with your child about punching the hole in the paper and putting the yarn through the hole and tying a knot. Talk about where spiders live, and what they eat. Ask your child what color they would be if they were a spider, or where they would want to spin his/her web. After the spider is all dry, your child can play with him! The play experience can open up a WHOLE other language experience based on your child’s play. You could also play a hide-and-go-seek game where you hide the spider and your child needs to find it by you giving him/her simple clues. Have fun…even the most SIMPLE of crafts can be a great language learning and vocabulary experience. Hope you are having a GREAT weekend! We are looking forward to Halloween on Monday. What are your children dressing up as? Very cute! I love Hand art! Thanks for linking up to TGIF! Thanks for cute spider idea! I made it with my artic group and put pictures using their traget sounds on it! What a cute activity for them to take home and practice! Love your site!! Melody LOVE that idea! I have made these many times with my artic kids too, so much fun! Thanks so much for stopping by! I am really enjoying your site. What a cute activity. Thanks Debbie! 🙂 So glad you are enjoying my site!